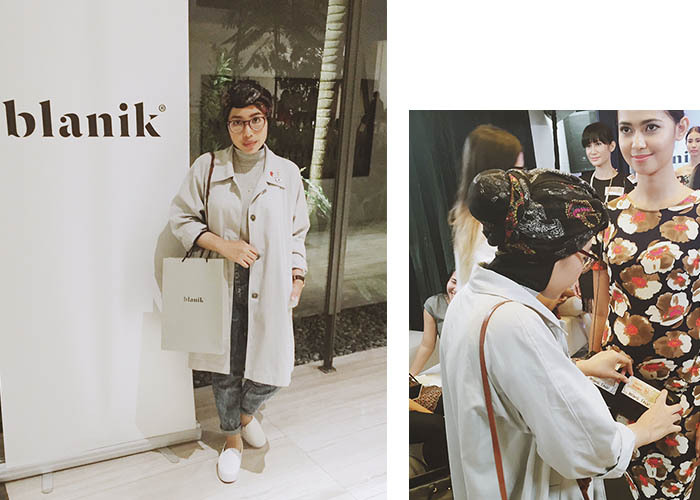 I was invited to the Blanik Exclusive Press Launch at Verde Apartment, Jakarta. Blanik is a fashion local brand who believes that each woman has their own beauty and uniqueness. You can show it through your fashion style. Blanik would love to accompanying women by providing clothes that can be chosen based on your signature style. There was a fashion show, Blanik web launching, talkshow with Blanik spoke person and Kelly Tandiono at the press launch. Through the fashion show I can see casual, workwear, until formal clothes made with love by Blanik for the sake of the uniqueness of women. My favorite is the black outer with fashionista print on it. I think long outer is so me. Any type of long outer describe my personal style at its best. The most fun part was as the guest we could choose two of our favourite items to be sent to our home. Of course I choose the long black outer and a clutch bag. I'll post about those two lovely items at another post. Thank you so much Blanik for having me. Thank you for believing that women are unique and should stand for their own beauty. Success to you! Feel free to check their collection at Blanik website here.